on 7 January, according to the Julian calendar. One of the most familiar fixtures at Bethlehem University for several decades has been Brother Joseph Loewenstein, F.S.C. Affectionately known as “Brother Joe,” he has been a member of the CNEWA family for a long time. For several years, in the 1980’s, he served as the director of our regional office in Jerusalem. Brother Joe was born in Queens, New York, in 1925 where he grew up during the depression. With two siblings, his parents had three children to attend to in those difficult economic times. Brother Joe attended an elementary school run by Dominican Sisters, the parochial school of the Brooklyn diocese of Elmhurst, Queens. The diocese offered scholarships for students to its secondary school, Bishop Loughlin Memorial High School, which was run by the De La Salle Christian Brothers. “I always wanted to be a priest,” Brother Joe says. “But at school I became interested in joining the Brothers. At 15 years old, Brother Joe left home to go to a training school for boys interested in joining the Brothers. “We were encouraged to focus on the vocation, and at that time it was common to leave home for that purpose” Brother Joe explains. He graduated in 1943 and went to Novitiate for one year’s training in the Brotherhood, after which he enrolled in Catholic University in Washington D.C. His class was sent to various schools after three years, before completing their Bachelor’s degrees, since there was a shortage of teachers during World War II. The work of CNEWA/Pontifical Mission made a lasting impression on me to this very day, which is difficult to explain. The work of CNEWA/Pontifical Mission is quite different from teaching and being cooped up in the classroom all day. The classroom and labs are quite immobile and inside, with rare opportunities to be outside. But there is a world outside the classroom. I saw and felt this reality with the work of CNEWA/Pontifical Mission. I had never worked with handicapped children. I was scared stiff the first time I visited the home. But seeing the children of all ages (including babies) made me want to cry, but gave me the strength to continue my regular monthly visits. I remember the first time one of my superiors from the United States came to see my work and I brought him to the center and how nervous he was about seeing these unfortunate children. Despite my attempts to prepare him, he had to excuse himself early in the visit. Another highlight of my work was regular visits to the libraries sponsored by CNEWA/Pontifical Mission in Nazareth, Jerusalem and Bethlehem. I was surprised the libraries were so well-used and the librarians were so popular. I always enjoyed these visits to the libraries, which were so helpful for education. I am pleased to say that in my supervisory position I was able to support constructing a public library in one corner of the university, having its own entrance outside the walls for the children and public, so it was accessible when the university was closed. Even when the country was still adjusting to the results of the Six-Day War, which limited our work to the local scenes and Gaza, where we supported a school for the blind, I was rewarded by the great help we were able to give — such as loans, verbal support, personal visits and so on. Today the most important work is the same as at my time: helping others. That means helping them earn a living, helping with medical needs or housing, especially when their house was destroyed or residents evicted. It also means helping, especially, the children, who often go hungry. My philosophy is ‘helping others’ — be they students, the poor, anyone in need. Children gather to recite morning prayers at a school run by the Sisters of the Destitute in India. 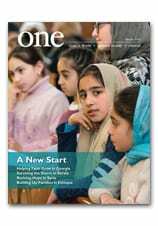 To learn more, read ‘My Great Hope Is the Sisters’ in the Winter 2016 edition of ONE. In this image from last month, people flee the Islamic State stronghold of Mosul, Iraq. Thousands who are seeking safety are finding shelter in the homes of strangers, sometimes inside Mosul. The dreams of David, and those of his 9-year-old brother and 26-year-old sister, are varied and often changing, but they all hold one element in common — the return of their father. David last saw his father seven years ago; he had given David a kiss goodbye at the door as he left for Russia in search of work. He has not returned since. “He makes telephone calls, but I don’t speak to him. I think he doesn’t even remember me,” the boy says, trying to hide his tears. Many men in the northern Armenian town of Tashir leave the country to work abroad; unemployment tops 50 percent in the region. Many who work in Russia provide the minimum means of subsistence for their families back home, but some never return. As a result, women are left behind to shoulder the burden of running households and rearing children on their own. Stories like that are repeated again and again throughout Armenia, where child poverty is skyrocketing. The prospects are often bleak. Many of the poorest children in Armenia live in distant, rural corners of the country. A significant number live on the streets; others live in “containers,” pre-fab boxes, not real houses. But for some, there is hope. The Church is watching over these forgotten boys and girls, street children who have no place to call home, at a caring place called the Artashat Center. It’s helping them as best as it can. Most of these children have never experienced a true Christmas. But this year, Archbishop Raphael Francois Minassian is determined to give them one belatedly. He hopes that CNEWA — and our kind donors — will help make it happen. He wants to buy simple gifts — gloves, a warm sweater, a pair of shoes — for 300 forgotten kids. He hopes to purchase it all and celebrate with the children a bit later in the New Year. You can help make this happen — and extend the spirit of love and generosity of the Christmas season through the New Year. In this way, you can help bring Christ into the world again and again, insuring that those most in need will experience joy and love long after the holiday is over. Visit this giving page to learn more. From all of us at CNEWA, thank you — and be assured of many prayers and good wishes during this Christmas season and in the New Year!